Tues Apr 16 - Chuck and John give their annual Safety Show. The Progressive Fishing Tournament for 2019 started with the first paddle of the year (Lake Wilson) and will culminate with the Last Ditch Fish Twitch on Dec. 8 & 9, with awards given, as always, at the Christmas Party. If you want to compete this year, you should read the rules first as there is a funny little scoring system for this. Check it out. Release and Waiver Form: (PDF, 3 pages) All paddle leaders should have a copy of this at each event, and ensure that every paddler has signed it before joining the group. 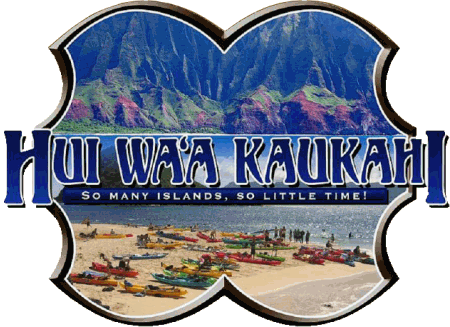 Paddle Ratings: We spent a long time coming up with a system that made sense for the kind of kayaking we actually do here in Hawaiian waters, so please read it carefully. You can also click on the rating icon (contained in the event description on the appropriate Schedule page) to see the whole document. Notice to Non-members: Just because we have posted our schedule on the world stage is not to say that these events (other than the Meetings) are open to the public. Because of liability concerns, these paddles are for Members only. If you live in Hawaii and are interested in becoming a member and joining us, please e-mail Rusty at the address below for info about coming to one of our regular meetings. Please read the FAQs about the club before you do. There is a PDF version of our new Membership Form here that can be printed and mailed in. NOTE: Non-members are however welcome to tag along as "guests" but they will be required to read and sign the new waiver, and pay a $5 ACA fee, before they can go. The same is true for Club members who have not renewed their ACA membership. Membership applications and payments can be mailed to Steve Harris, at the same PO as above.